Tiptoes!" the young elf squeaked before yanking desperately on the left rein. Her wolf veered sharply and tripped off the low beam. The elf clutched at him, slipped sideways in the saddle, and they both tumbled awkwardly to the ground. Ruzi fought the urge to laugh. "Tiptoes? Is that your new nickname?" The wolf growled in response to his question and gave the young elf an indignant look. "Tell me what you did wrong," Ruzi said to his two-legged student. It was the elf's first time at the training hall, which was a combination obstacle course and classroom. The large, airy hall had a sprawling training floor with an elaborate network of high-wires and hanging obstacles. The room smelled of cedar shavings and honeysuckle, which flowered on the latticework walls. On sunny days like today, Ruzi opened the ornate glass skylight to let in the summer breeze. As Master Trainer, Ruzi taught the youngest Selesnyans and their wolves to become Wolf Riders. The assortment of boxes, pillars, and beams were designed to mimic the environment his students would face as they traversed the rooftops of the city. "Pulled the rein too hard?" she mumbled, brushing sand out of her wolf's reddish fur. The girl and her wolf, both on the early side of adolescence, had the wide-eyed curiosity that he missed from his childhood. They also had the long, gawky limbs that he missed not at all. When she looked confused, he turned to the rest of his pupils, who watched attentively from the wooden dais that ran around the perimeter of the training floor. This group of youngsters was new to training, but all had been born into the Conclave, so he recognized their faces. 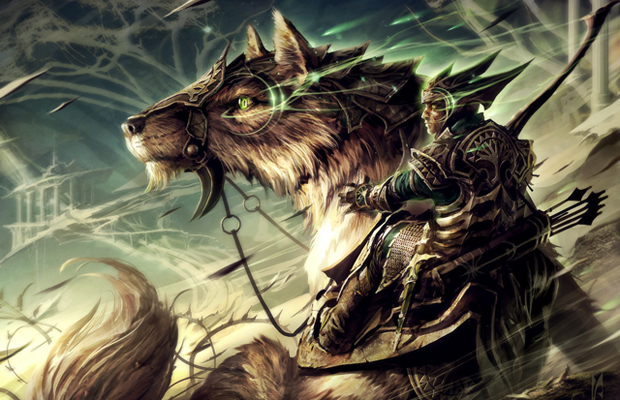 Riders had to bond with pups at a young age, so adult recruits to the guild rarely attained the status of Wolf Rider. No one spoke. They just stared at their teacher with quiet reverence. Ruzi was a legend among the Selesnyans, much to his annoyance. But it would only take a few training sessions for the youngsters to forget about his heroism during the District Riots and focus on the work of making themselves into competent riders. "She slowed down before she reached the beam," Ruzi said. He turned the crank on a pulley and raised the narrow beam high off the ground. "By decreasing speed, you diminish agility. You have to trust your wolf's instincts and not give way to your fears." "Kuma!" Ruzi called to his wolf, who was already jumping down from the dais to take his place beside his rider. Kuma was without saddle or reins, so Ruzi crouched on the wolf's broad back. As soon as Kuma felt his rider's weight, he sprang between the staggered platforms until he reached the highest station near the ceiling. The narrow beam swayed in the wind that swept down through the open skylight. But Ruzi urged his wolf forward without hesitation. Kuma seemed to dance across the span while Ruzi mimicked shooting arrows at his awed students. Back on the ground, Ruzi smiled at Kuma, who gave a toothy grin of his own. "Trust your wolf," he said. "Assume it's at least twice as smart as you." His students laughed and headed for the exit, playfully romping with the wolves they'd been bonded with since before they could walk. When the last one was out the door, he finally acknowledged the dryad who had been seething by the door for most of the session. He'd wanted her to leave, so he'd ignored her and her increasing frustration. "Welcome, Mazena," he said. "What can I do for you?" "We have an important message from Guildmaster Trostani, and you kept us standing for ages," she snapped. "Would you have me neglect my students in favor of you?" he asked. Mazena was one of Trostani's most trusted advisors. Her charisma could not be refuted, but her legalism was insufferable. She emanated an aura of power and self-assurance that both drew and repelled him. "We would have you spend more time praising the Worldsoul than doing carnival tricks for the children." "It's hard to learn what you cannot see with your own eyes," Ruzi replied. Ruzi wasn't popular among the dryads. His discontent with guild leadership was widely known, and only his heroic past kept him in the good graces of the dryad leaders. "And yet the Worldsoul is our greatest teacher and greatest mystery," Mazena said. She was quoting a passage from Trostani's Teachings, the surest way to end any discussion. "What do you want?" Ruzi asked rudely, deciding that philosophical debate was only prolonging the inevitable. Ruzi loved his guild—building gardens, nurturing animals, the honoring of life and community. But secretly, he loved the work of the guild more than he worshipped the Worldsoul. Selesnyans believed the Worldsoul was a collective unconsciousness that guided them toward unity and harmony. Ruzi found it easier to trust in his wolf and the bow in his hand, and to use them if necessary. "We want harmony," Mazena said. "We want peace. We want what is best for the Conclave." Ruzi had seen far more harmony from the threat of violence than from songs sung of the Worldsoul. "Why are you here now? At this moment. Standing in my classroom." "Trostani has sensed a troubling... situation," she said. "You must go to the Rubblebelt. You must leave today." "What?" Ruzi asked in surprise. The Rubblebelt was a ruined tract of land that began at the far edge of the Tenth District. "That is not a meager journey." "It is best for the Conclave," Mazena said. "Or as a hero, do you think you are too good for service?" Ruzi fought the urge to argue with her. There was something inaccurate with every facet of that statement. 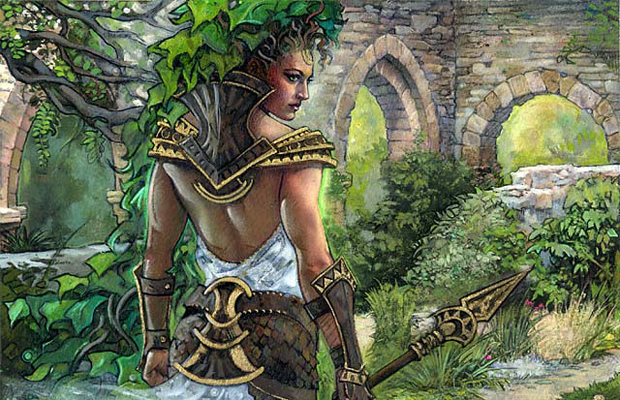 But such was the manipulative nature of dryads. "What do you want me to do there? Spy on the Gruul? Bring back some boar for dinner?" Despite her beauty, the dryad made a remarkably unpleasant face. "Must you really ask?" "You want me to go to Cecilee," he said. "You want me to find my sister." "She is your blood, your family within our family. How can you hesitate?" He hesitated because she had changed from the girl he grew up with. She left Vitu-Ghazi to settle in the wasteland of the Rubblebelt. 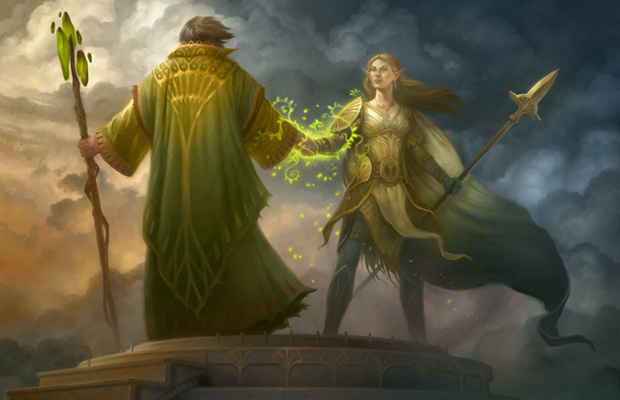 She left to heal the sick and dying, to bring harmony to those who knew only chaos. She left, and he never expected to see her again. When they were young, the three of them—Cecilee, Ruzi, and his wolf Kuma—had been inseparable. But Cecilee was now the leader of her own community, and the words that came of her mouth never seemed like her words. He'd heard that she'd adopted an abandoned Gruul child to raise as her own. The Wolf Riders who visited her told him that his new nephew was even named for him. But Cecilee herself had sent no news or made any attempt to contact her brother. Still, Mazena the Manipulative was right about one thing. When it came to Cecilee, it wasn't in him to say no. Hours later, Ruzi and Kuma had reached the last roof at the edge of the Rubblebelt. It was not yet dawn, although the far horizon was tinged with the red of the coming sunrise. Ill at ease, he surveyed the unfamiliar ground below. For years, Ruzi and Kuma had traveled the skyways together. 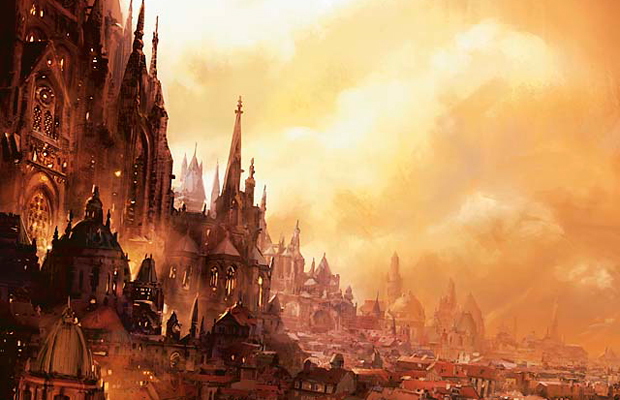 He loved wandering among the domes to spires where he could feel the sunlight unobstructed. Rooftop gardens dotted the rooftops, little patches of growth and color, which gave Ruzi hope whenever he spotted them. Ruzi hated the din and squalor of the ground, where the sun barely filtered to the cobblestones. Down below, everything was tinged with a brownish haze. The brightest colors were the raggedy clothing of children. 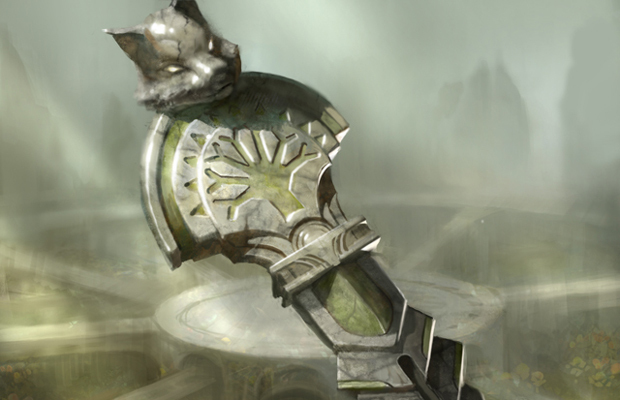 He and his wolf could travel for days across the tops of building and Kuma's paws never had to scuff the streets of Ravnica. But it seemed they no longer had a choice. Before them, the inky darkness of the Rubblebelt stretched like a pit of black nothingness. No lanterns, no comforting scent of leaves, nothing but a desperate scrubland of rubble and savages. "This is where Cecilee chooses to lay her head?" Ruzi murmured to his wolf. Somewhere in that darkness was his sister's small vernadi, a burgeoning community of devoted evangels, who were intent on bringing the truth of Selesnya to all who had not yet heard of it. "If anyone can make roots grow here, it's Cecilee," Ruzi assured himself, as they backtracked to look for a way down to street level.